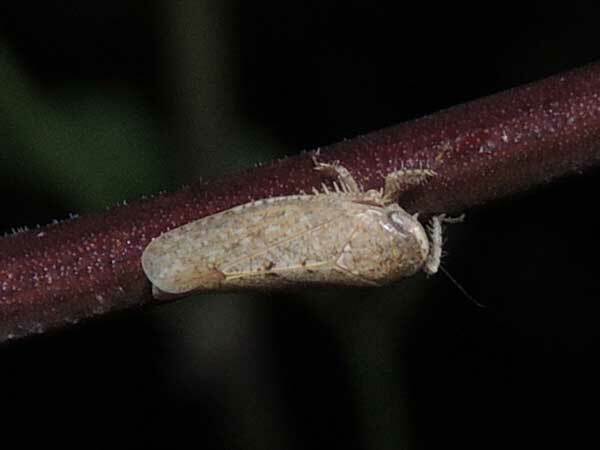 This leafhopper is less than 5 mm long. It is sitting on a young twig of Velvet Mesquite (Prosopis velutina). Observed at night, Vekol Valley, Maricopa Co., Arizona. 28 March 2015. There are over 3000 known species of leafhoppers in North America and there are many, many more yet to be described and given proper names. Identification to species normally requires considerable and uncommon expertise. Leafhoppers feed entirely by taking sap in though their straw-like mouth parts and tend to concentrate their feeding on new, tender growing stems and shoots. This specimen was found on mesquite at night. Perhaps during the day when it is not feeding it rests on older twigs that almost the same color and pattern, thus camouflaging itself from birds. Leafhoppers insert their eggs right into soft plant tissue using a specialized ovipositor. Copyright Michael J. Plagens, page created 19 April 2015.